SCVHistory.com | Saugus | Green Pastures Dairy Farm (Pre-Saugus High) in 'The Green Hornet' Ep.6, 1966. Green Pastures Dairy Farm in "The Green Hornet"
Episode 6 of the single-season television crime drama "The Green Hornet" — "Eat, Drink, and Be Dead," which premiered October 14, 1966 — is centered around the Green Pastures Dairy Farm at 27397 Bouquet Canyon Road, the site of the future Saugus High School and surrounding subdivision. 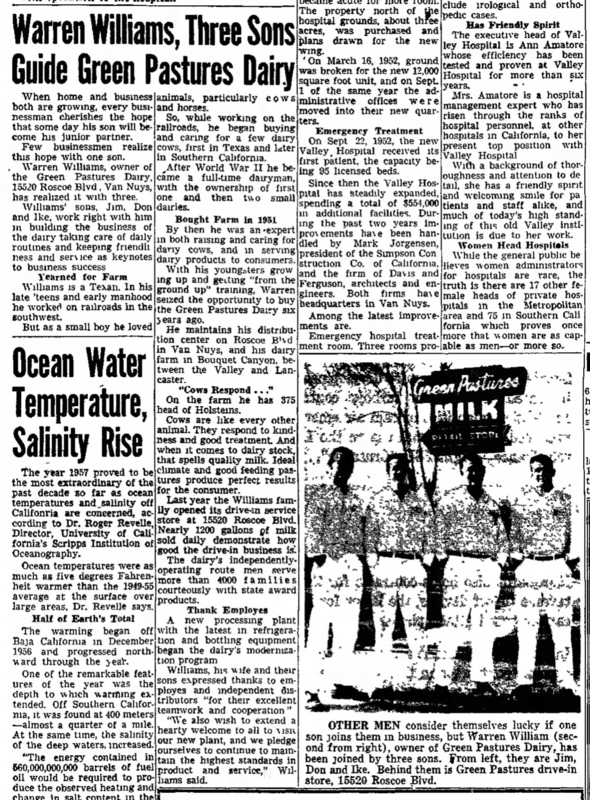 The origins of the dairy are a bit of a mystery, but it appears to have been started shortly after World War II by William J. Clark, a retired LAPD homicide investigator. Born in Texas in 1901, Clark came to California by way of New Mexico and joined LAPD when he was 23. Together with some other L.A. policemen, he pursued his entrepreneurial dreams on the side. 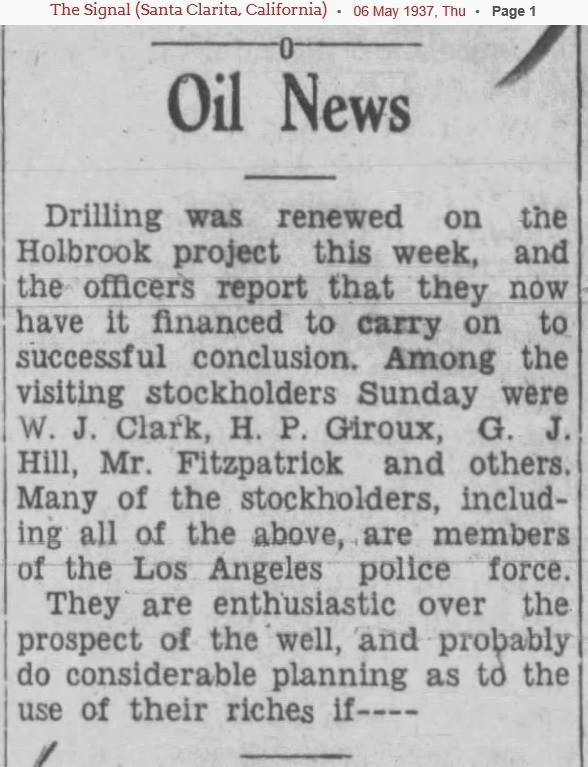 In the early 1930s, Clark came to the Newhall-Saugus area to try his luck at gold prospecting and oil drilling. 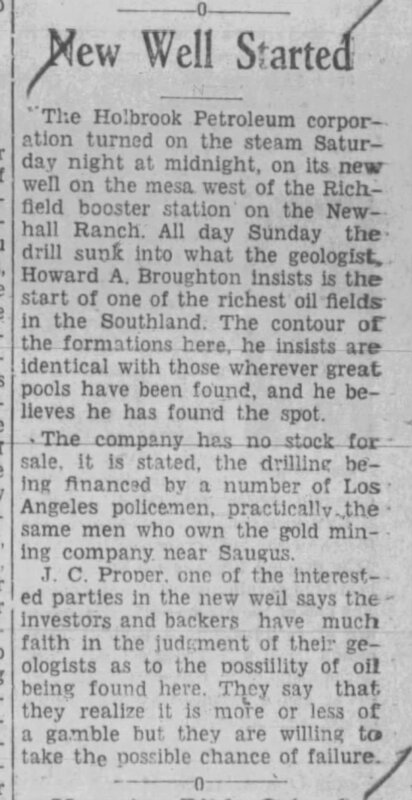 His wells were dusters, but his placer mining exploits over the years netted him $35,000 that he reportedly invested in good Bouquet Canyon bottomland. Clark had developed an interest in farming in 1938 when he sharecropped alfalfa on a 1,700-acre leasehold from Newhall Land, billing himself as the Alfalfa King. 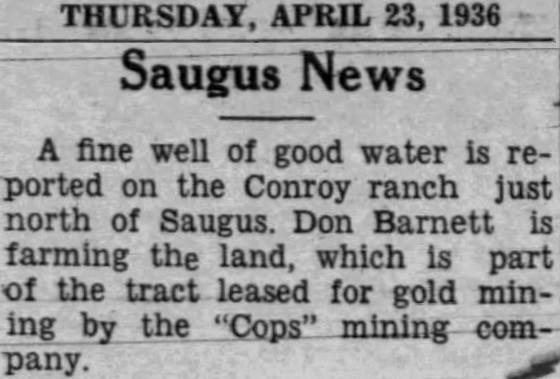 Retired from LAPD by 1945, he apparently purchased the Conroy Ranch on Bouquet Canyon Road — which he and his LAPD partners had previously leased for oil exploration — and ran it as the W.J. Clark Ranch, proffering hay until the early 1960s. 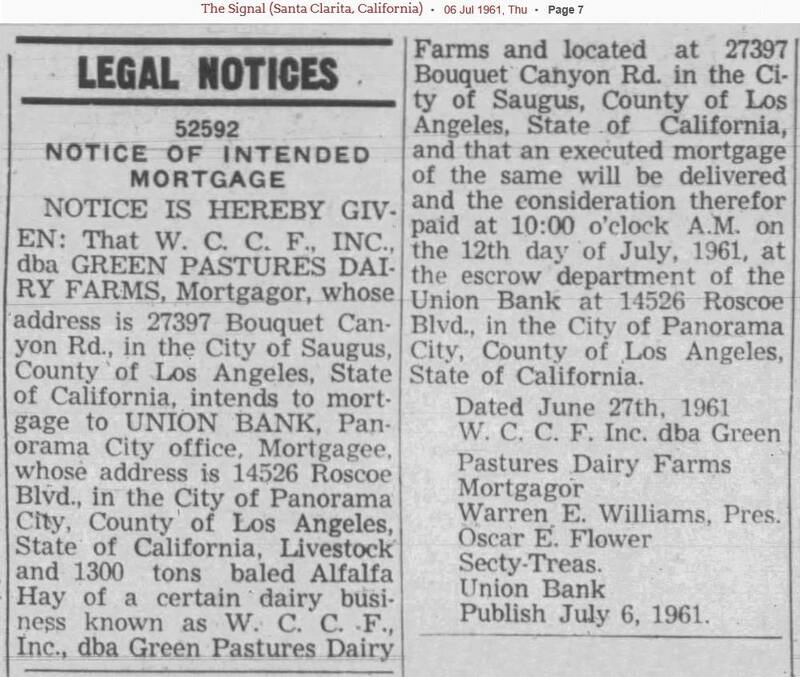 At some point he established the Green Pastures Dairy and purchased the preexisting Green Pastures Processing Plant on Roscoe Boulevard in Sepulveda (North Hills) to process and distribute his dairy products. Enter Warren E. Williams, a Texan who came out (farther) west in his teens to work on railroads. 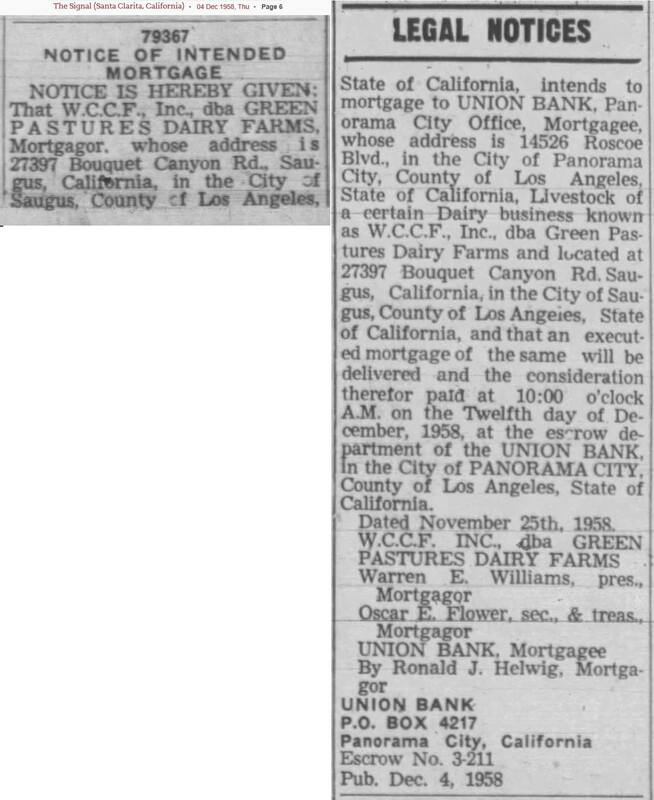 News reports state Williams bought the Green Pastures farm in Bouquet Canyon in 1951 and operated it in partnership with his three sons, Jim, Don and Ike. 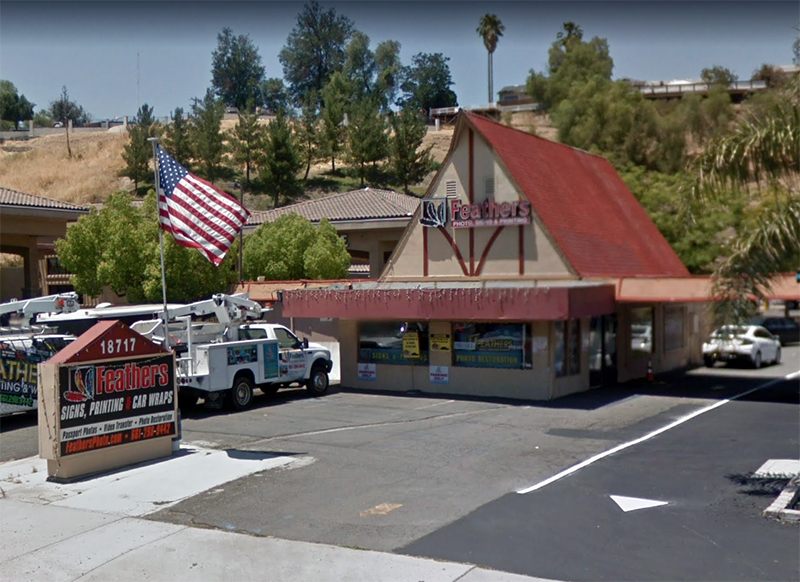 He also purchased the processing plant in Sepulveda and started opening retail dairy outlets in the San Fernando and San Gabriel valleys. The 1963 dairy store building on Soledad Canyon Road as seen in 2018. Google Street View. Click to enlarge. Clark was still in the picture. 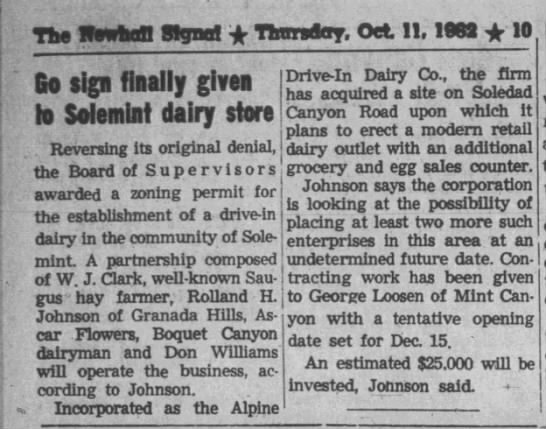 By 1965, Clark and the Williams family had built 12 retail outlets including the dairy store at 18717 Soledad Canyon Road in Canyon Country, which still stands in 2018. 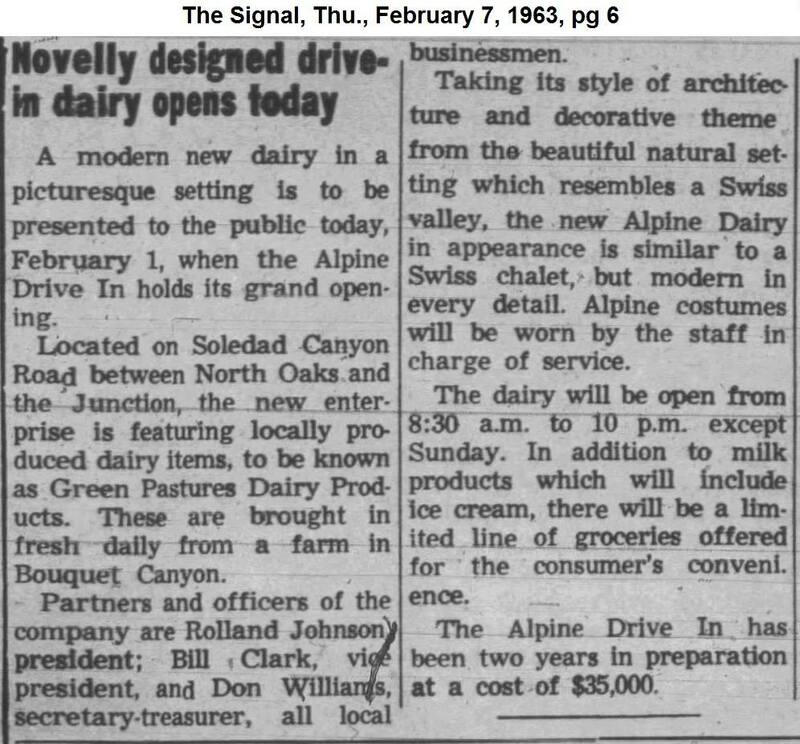 Opening in 1963, the store was separately incorporated as the Alpine Drive-In Dairy Co. (it mimicked a Swiss chalet in design), and its corporate officers were reported as Rolland Johnson, president; William J. Clark, vice president; and Warren Williams' son Don Williams, secretary-treasurer. 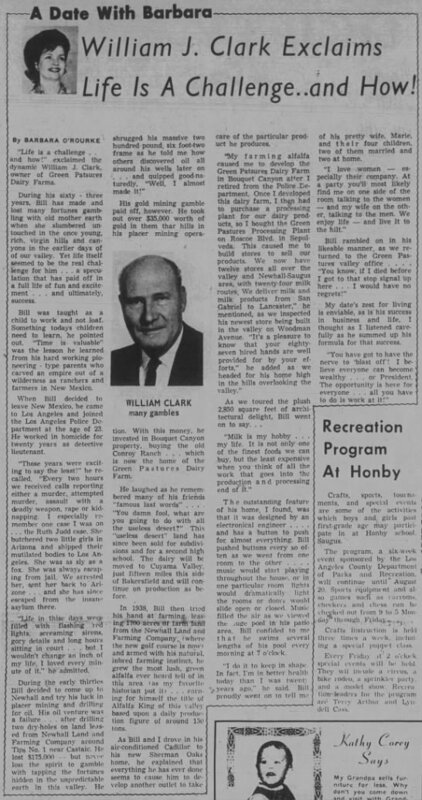 In 1965, Clark said Green Pastures was operating 24 milk routes from San Gabriel to Lancaster and had 87 people on payroll. By late 1966, W.C.C.F. 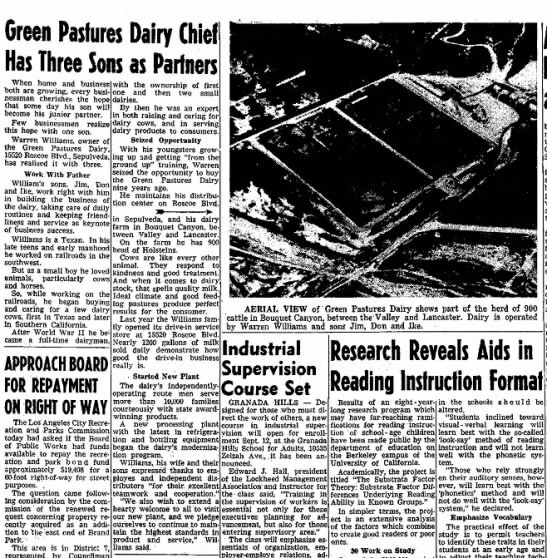 had sold the entire operation to one Harold J.J. Stueve, who on October 31, 1966, transfered it to the Stueve family partnership — Harold, Edgar and Elmer — known to the public as Alta-Dena Dairy. According to the first Saugus High School yearbook (1976) (pg. 9), the William S. Hart Union High School District purchased the Bouquet Canyon dairy property for the school in February 1969 and broke ground October 24, 1973. Historical research by Tricia Lemon Putnam.